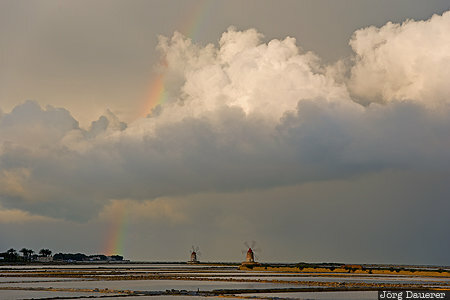 Two windmills and a rainbow below a cloud illuminated by warm morning light at Riserva Naturale dello Stagnone near Marsala. Marsala is in the western part of the Mediterranean island of Sicily, Italy. This photo was taken in the morning of a sunny day in April of 2017. This photo is in the Photo Calendar "Sizilien". This photo was taken with a digital camera.